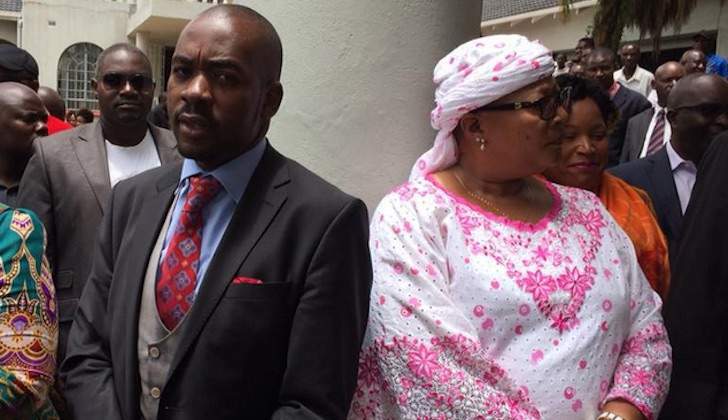 THE battle for control of the opposition MDC-T alliance's resources has taken a new angle with leader of the breakaway faction Thokozani Khupe threatening to take her rival Nelson Chamisa to court demanding a share of the $1,8 million disbursed to the party under the Political Parties (Finance) Act. The money was released to Chamisa's main opposition grouping shortly after Khupe and her team had 'fired' for alleged insubordination. Khupe's deputy Obert Gutu, yesterday said the faction had engaged lawyer Lovemore Madhuku, to pursue the matter in court. "The legitimate and constitutional MDC-T led by Honourable Thokozani Khupe, has instructed our lawyers to institute legal action to recover the sum of $1,8 million that was improperly and fraudulently paid to our erstwhile comrades in terms of the Political Parties (Finance) Act," he said. Gutu said because Chamisa applied to have the case over the leadership of MDC-T removed from the roll early this week, it meant that Khupe was now the legitimate party leader and was therefore entitled to control all party resources. But, MDC-T chairperson, Morgen Komichi dismissed the planned lawsuit saying it was devoid of merit and was just a ploy to slow down the "people's movement" and distract their attention from the pending general elections. "Those guys are not the MDC-T, it's just a group of four people who left the MDC-T and went to form their own outfit. It is silly for anyone to think that they are entitled to funds received and managed by the MDC-T from anywhere when they are not part of that organisation," Komichi said. He said worse still, the money was released by government to the party before Khupe and his team "fired" themselves. "That money was released when they were still part of us, they were boycotting meetings and when the money came they chose not to be part of the decisions made on how to use it and cannot, therefore, turn back and say they want that money," Komichi said. "In any case, government which made the payments, agreed with us that Khupe was fired from the MDC-T when through one of its arms the Legislature, declared Khupe's seat vacant following a letter from the party. How then could they be the legitimate MDC-T in any case," he queried.